Cinco De Mayo Tees that are just $12.99 !!! reg price $29 !!! How funny are these , Cinco De Mayo Tees that are just $12.99 !!! reg price $29 !!! Let’s taco bout it! 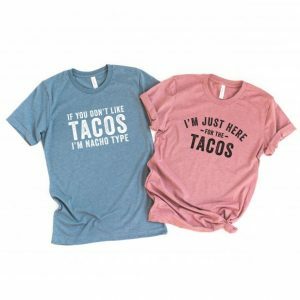 Tacos are a must and with Cinco De Mayo coming soon you’ll have a fun shirt to wear to celebrate your love for tacos! Spring Sunnies for just $8.99 !! reg price $19 !!! Baby & Toddler Fringe Sandals for only $8.99 each !! reg price $30!! Stressed Blessed and Pumpkin Spice Obsessed Tee for just $14.99 !!! Reg price $31 !!! Extra Long Layering Cami for $8.99 !!! reg price $13 !! adidas Samba Primeknit Shoes Women’s are just $46.99 !!! reg price $110 ! !